How to enter a refund for customer in Microsoft Dynamics GP? In the debit memo distribution, credit an offset suspense GL account and debit the normal Accounts Receivable account. Post it. Apply the debit memo on the credit balance (over payment) to clear the customer balance. Open the Miscellaneous Checks window (Transactions >> Financial >> Miscellaneous Checks. Print the check and post it. 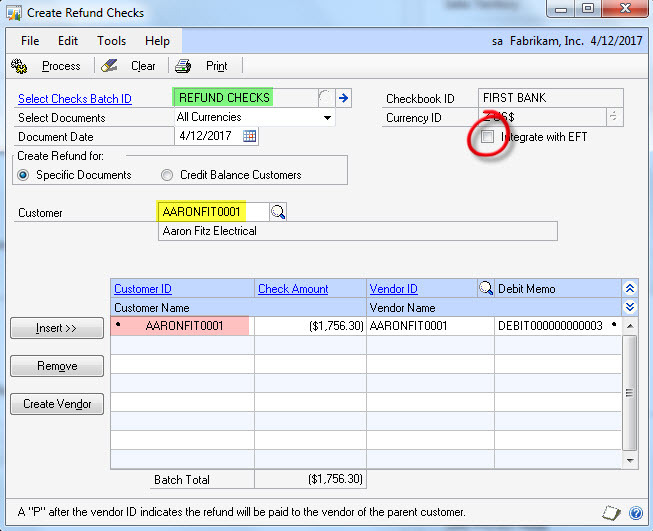 In the Receivables Transaction Entry window (Transactions >> Sales >> Transaction Entry), select the document type Return. This type of transaction will credit the cash account and debit the return account. here is what I did, the customer had a credit balance of 1000.00 which was paid via credit card. In order to refund her the money on her credit card, I created a return in the accounts receivable module refunded her credit card. I am not sure what the distributions would be on this return. I can not apply a return and a payment to one another. How will I fix this? I know that I will need to some how created two debit memo’s but what accounts will should they hit? Also what accounts should the return hit inorder to clear this up? The orginal payment hit cash/accounts receivable, although in a perfect world you would think that I could just reverse this out but it is not right. I need some help, thanks! 1. First of all, you don’t need to enter the return as you already have credit balance from credit card payment received from customer. I am assuming you have not posted this return as you are not sure account GL accounts. 2. You can create a debit memo for the customer and apply it on the customer balance. In account distribution, accounts receivable account will be debited and on credit side you can use a suspense account. You can use any GL suspense account as its balance will be cleared at end of transaction. 3. Now, create a temporary vendor corresponding to the customer. You will use this vendor to record a credit card payment you made to customer. 4. Enter a Misc Charge for the temporary vendor. In GL distribution, AP account will be credited and on debit side use the suspense same as in step 1. At the end of these steps, customer balance should be cleared and a credit card payment will be recorded corresponding to payment you made to customer. Enter proper descriptions in these transactions to describe it was a refund. Plz help me about how to edit the payables transaction credit memo through c# code. Hi. I read this article about refunding an overpayment in GP. I have a customer who has overpaid an invoice, and now has an unapplied credit on their account. They would like this refunded to them as a credit memo, which would then be applied to a future invoice. What entry would be made to accomplish this?